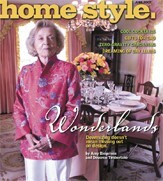 Wonderland | Home Style | Style Weekly - Richmond, VA local news, arts, and events. Downsizing doesn't mean missing out on design. Passion can make a house  or a person  more interesting. And because she was "starved for art," as Sarah Belle November describes her years studying chemistry and biology, she experienced an equal and opposite reaction: a desire for art that worked itself into a froth. Discovering contemporary artists became, if not an obsession, certainly a favorite act. Along the way in her marriage of 57 years and counting, she and her husband, Neil November, have acquired a gallery's worth of paintings and objects. "There were times I said, 'I don't know where it will go, but I gotta have it,'" she admits. And their house, a sprawler with a view on Riverside Drive, held it all with wall space to spare. But the time came for a move, and the puzzle of how to fit all that art into a new apartment at Westminster Canterbury yielded solutions that might amuse a curator. To adapt to their smaller but no less elegant digs, the Novembers unloaded thousands of books and other items  but not much of the art  and now find themselves gazing in every direction but back. The source of their stimulus is a collection that includes blown-glass sculptures, some two dozen surrealist paintings by Nancy Witt, portraits and etchings, and contemporary works that fill every room, including closets, the laundry and also the living-room ceiling  where a three-dimensional Witt painting is mounted in a stroke of daring that's caught a bit of attention from neighbors. The Novembers are used to being noticed  she's a former actress with a penchant for good jokes and exotic locales; he's a businessman and philanthropist whose pet projects are among Richmond's notable: the Science Museum of Virginia, Virginia Aviation Museum, William Byrd Community House, the Jewish Community Center, Lewis Ginter Botanical Garden and others. An extravagant performing arts theater at their new address is another highlight, named for a somewhat embarrassed Sarah Belle, but also in tribute to their late son, Scott November, and a gift to residents and the community. That, along with their art, gets visitors talking. A Dale Chihuly vessel sits on their dining-room table. Blown-glass swirls by Richard Royal, glistening in purples and greens, form a triptych on the wall. "I just love watching it from my bedroom," Sarah Belle says of the piece, referring to its changing colors as the eastern sun moves across the space. More glass art from Benjamin Moore of the Pilchuck Glass School is nearby, and a prismatic gyroscope by Jon Kuhn "sparkles all over the room when the sun hits," she says  "and Neil loves to spin it anytime." More works by Sonja Blomdahl, John Littleton and Kate Vogel are placed on chests and tables. Though her husband chose only a few of the pieces, his artistic heritage is celebrated at the front door. Paintings by his mother, Sara November, show her progression from sophisticated commercial artist (fashion prints in the style of Erté) to an accomplished portraitist whose friendship with legendary artist Theresa Pollack formed an impressive Richmond alliance. Sara November's studies of her son are some of the first works a visitor sees upon entering the residence, and each piece has a sentimental story. Passion extends to other parts of a life well-lived, and this husband and wife jostle and tease as they define each other's qualities: He's organized, creative, funny, she says; she's thoughtful, humorous and worldly, he adds  all characteristics that find their way into their living environment. Art is respected but treated almost casually. Clouds and butterflies painted by Happy the Artist give whimsy that might otherwise be a non sequitur. Objects from travels are arrayed on shelves in the hallway. Throughout the space, decorator Mary Schroll has installed soft, luminous fabrics and art-enhancing neutral colors that reflect the tastes of a modern-minded couple living in a traditionally Richmond setting and making their mark with sweeping strokes. The Novembers have slowed their acquisition phase, for the most part, and are equally invested now in giving away. "In our case, we don't have a second home or fancy cars  I drive a Ford Focus," Neil November says  "so we try to give where it can make a difference. I'd rather not be a drop in the bucket  I'd rather be a splash." View the photos from this article. These are not words from which Mary Easterly shies away. They are, in fact, cardinal directions in her interior design philosophy and unmistakably on display in her new home, a free-standing cottage at the front of Westminster Canterbury's verdant campus. After Easterly's husband, Harry, died in June 2005, she knew she couldn't stay in their sweeping, one-story river house on Cherokee Road. She packed up and moved to the retirement community and took her decorating in a direction that was off-limits while her husband was alive. "I wouldn't say Harry was a pink guy," Easterly says. But she is one pink gal. The walls, the furniture, the window treatments, aren't blush or salmon, but a vibrant, sturdy construction-paper pink. One neighbor fondly refers to her new home as the Pink Palace. But don't be fooled. The Pink Palace isn't all bubble gum. It's full of inventive decorating strategies that showcase Easterly's unique character. She does have a co-conspirator in all of this. David Barden is her decorator, and the two have collaborated closely. When they began the project in the summer of 2005, they explored high-end décor options in New York. 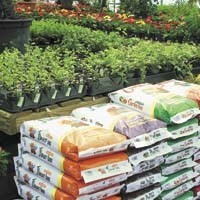 Barden had worked there for years and still had clients to visit. "I drove her car"  a Lexus SUV  "and she stayed with friends in Manhattan and I stayed with friends in Queens," Barden recalls. She read the paper while they listened to swing and big band on the car stereo and snacked on tuna-fish sandwiches she'd prepared for the trip. It was on such a trip that they found the leopard-print carpeting that lines her den. "That's from Stark in New York, and it's not for the weak-minded," Barden says. Patches of leopard spots are interspersed with medallions of pale green and pink accents. "That carpet's got some guts," he says, but it has to balance a studded hot-pink Ultrasuede club chair and ottoman, so it was the only option, really. "It needed some wow factor underneath it." Barden had runners made from the leftover carpet, so the pattern echoes throughout the house. On the walls of her den are blown up black-and-white photographs, one of Easterly and her late husband on their wedding day. He's wearing his Marine uniform, and she's wearing a dress with a long train, made before the fabric shortages during the war forced Miller & Rhoads to stop selling such dresses. The pictures are framed with hot pink matting. In a cozy annex off the den, Easterly has her computer. A light fixture made of metal daisies hangs overhead. In the old house, it was white and yellow, but after the move she had it repainted black and pink. Another one of Easterly's secret weapons is Tammy Hinkle, a decorative painter with a sharp eye. In Easterly's not-so-pink kitchen, Hinkle has painted a faux mosaic finish over the countertop to match the birds embroidered in hankies that are framed above the cabinets overhead. When Barden and Easterly chose a shower curtain with ornate pink dragons, Hinkle repeated the images, painting two pink dragons on the bathroom wall. Down the hall, Easterly's bedroom has pink chandeliers, pink bedding and pink patterned drapes. Barden installed motorized rods so that she can open and close the blinds by remote control. In the center of the downstairs is a formal living room. Believe it or not, it's blue. Perhaps David Easterly felt about blue the way his wife feels about pink. When he was living, "the whole house was blue," Mary says. Easterly's children likened the blue carpeting throughout the house to a blue river running through it. The pink reasserts itself in the dining room, though, where fat pink bows wrap around the chair backs like a collection of bridesmaids' dresses. Despite all these well-appointed spaces, the real action happens out in the garage. That's where Easterly says she does most of her entertaining. "The garage is just kind of a trip," Barden says. "I didn't realize she was going to have catered parties out there, but it turned out kind of fun. It's the talk of Westminster Canterbury: going to Mary's garage." The garage is carpeted and well-lighted. She has photographs of her family up and pictures of characters from "Alice in Wonderland" that she painted on the cabinet faces from the old house. "My husband kept leaving the kitchen cabinets open," Easterly says, "so I thought the best thing to do is paint them something funny." With the bulk of the decorating complete, she's settled in to other tasks, like writing her memoirs and self-publishing a rhyming children's story about her dog.